To many, one of the most daunting necessities of life is facing numbers. Numbers intimidate people even though they are everywhere: how much was spent on this month’s groceries, how far is the workplace from home, how many milligrams should you take to not overdose, and so on. In business, their biography is written in numbers on a book called a balance sheet. 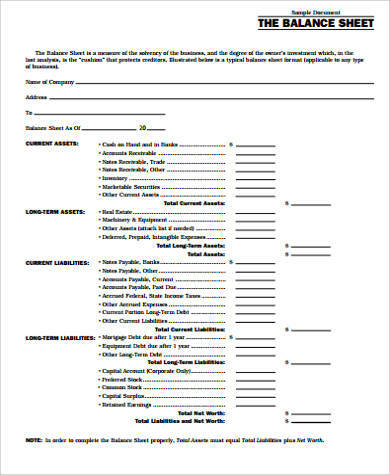 A balance sheet is a snapshot of a company’s financial position in a specific point in time. It shows its reader the company’s assets (what it owns that produce economic benefits), liabilities (company debts or services that must be accomplished), and shareholder’s equity (the business’ value to its stockholders). 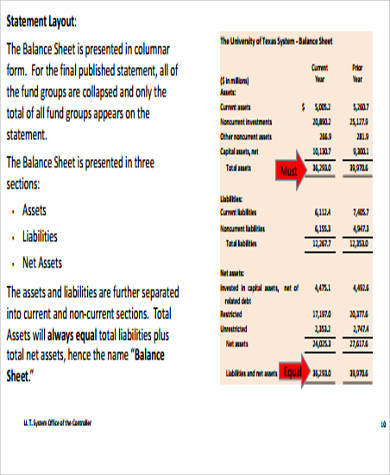 Have a look at our free downloadable Sample Balance Sheets and study them to learn more. 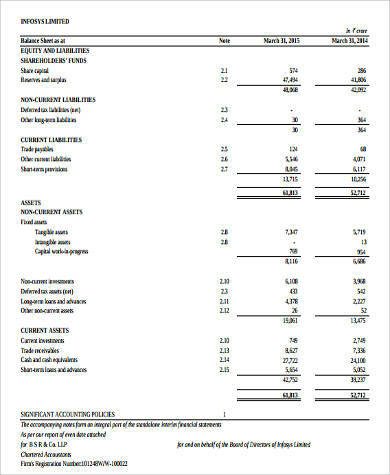 A balance sheet follows the formula: the sum of the total liabilities and the shareholders’ equity is the total assets of a company (TA=TL+SE). The contents of a balance sheet fall under these three. However, not all contents—called accounts—of a balance sheet are the same in all companies. They differ depending on the type of the business. 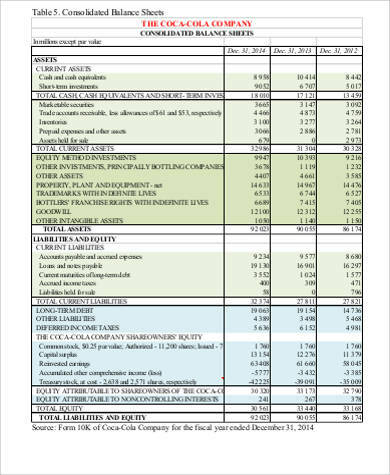 Here is a brief overview of the contents of a balance sheet. Total Assets. What the company owns that can produce economic benefits for them. Current Assets. What the company can sell, turn into cash, or consumed within a year or less. Under current assets are cash, short-term investments, accounts receivable, etc. Long-term Assets. Assets that cannot be turned into cash, consumed, or sold in a year or less. In short, any asset that is not a current asset is a long-term asset. It includes investments, fixed assets, intangible assets, and so on. Total Liabilities. What the company owes that must be accomplished. Current Liabilities. Debts that must be paid in a year or before the end of one operating cycle (period when a company releases cash to produce products and those products are sold and turned back to cash). This results in a new current liability, using current assets, or providing service. Under this are bank indebtedness, accounts payable, accrued expenses, and more. Long-term Liabilities. Obligations that can go beyond one year or operating cycle before getting liquidated. These are presented as the current value of all future cash payments. Notes payable, long-term debt, pension fund liability, and more fall under this. Shareholders’ Equity. Also known as the owner’s equity (for sole proprietorship), it is the difference between the total assets and total liabilities (SE=TA-TL). Under this are common stock, preferred stock, retained earnings, and more. Download our free sample balance sheets and see how those parts are calculated. Of course, you should hire a professional, but knowing is better than nothing. 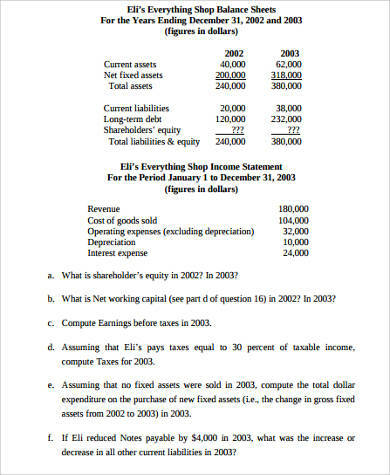 For more details, you can also take a look at our Accounting Worksheet Samples. 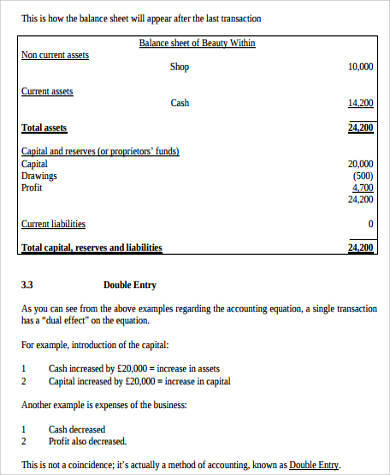 Our free downloadable samples can give you the basics in making your own balance sheet. A good balance sheet can help you attract investments and help your business grow. But a balance sheet is simply a mirror that reflects the health of your business, meaning, if you are having trouble, your balance sheet will not fix it for you. You should consult professionals on what to do next. 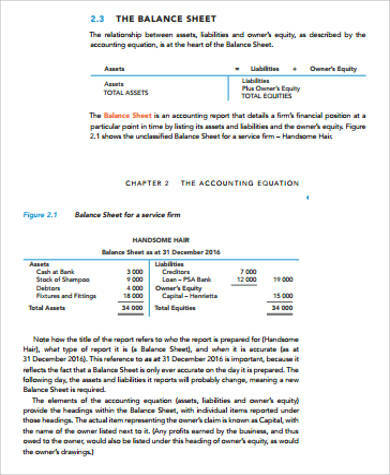 The downloadable balance sheets come in PDF format. You can also learn more by having a look at our Balancing Equations Worksheets.